Intel has released a new version of its OpenCL SDK. The main new feature is the support of the 3rd generation of Intel Core processor family (Ivy Bridge). And with processors with Intel HD Graphics 4000/2500 (Ivy Bridge), OpenCL is available on both CPU and GPU devices! 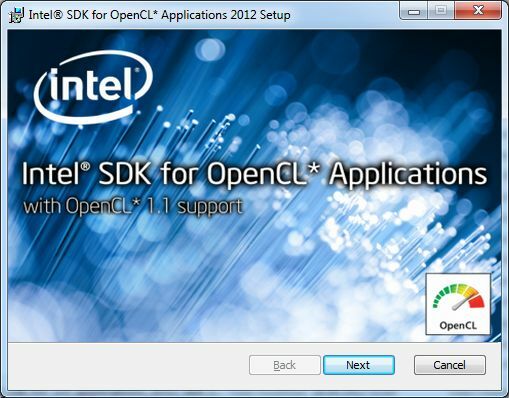 You can download Intel OpenCL SDK from this page: Intel SDK for OpenCL Applications. More information about this new SDK can be found in the release notes. New code samples like 3D Fluid Simulation using OpenCL or OpenCL and Microsoft DirectX Video Acceleration Surface Sharing are available. It’s great to see such a wide support for OpenCL now. Surely CUDA will become obsolete. CUDA is already obsolete. The only one who hasn’t realized that is JJH and his team. It depends on what are you working on. I prefer stability, performance and tools that CUDA provides. CUDA is hardly “obsolete”, as it is rapidly evolving API, together with the hardware that is closely tied to. CUDA is still, by far, the prime choice for any grade of HPC and workstation utilizing GPU-accelerated workloads. The only downside of CUDA is that it is not explicitly heterogeneous architecture. But OpenCL Renderer are horrible slow in comparison to CUDA! opencl will never be fast until nvidia decides to actually write a native library instead of a cuda wrapper.